What a Market this past Saturday! There were between 7000-8000 attendees, the weather was scrumptious, and the vibe was good. What a great way to end September. Next up - October, the month that best demonstrates how the tone of the Market shifts with the weather. While a major focus is still (always) fresh, seasonal produce and other food, as the season comes to a close, patrons will see an increase in art and craft vendors. 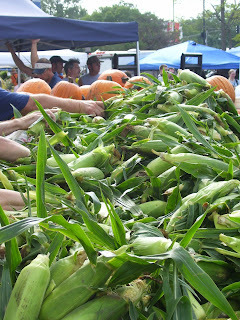 Things will look different, too - some vendors will be in different places due to the seasonal shrinkage in the Market's size, and some vendors you might be used to seeing, like Roth's Countryside Produce in Row 5 and Schottman's Sweet Corn in Row 4, are done for the year. Some vendors you haven't seen at all this season, like Kent Miles of Illinois Willows (you know, the flower guy who, in years past, set up with his amazing arrangements on the Illinois Street row?) are just now arriving. We're co-presenting the Second Annual Bicycle Rodeo - an event put together by C-U Safe Routes To School to promote safety and skills for kids biking to school or around the neighborhood. Representatives will be at the Market from 8:30 - 11:30 A.M. to help fit kids for helmets (helmets will be available for $10), help kids navigate bike skills stops, and to hand out safety information. Bikes are being used more and more - let's get kids road-ready! For more information, please call 217-398-4206 or 217-278-9059. You can download the official flyer here. Join area artists, City staff, and supporters of Urbana's Public Arts Program for a mask-making workshop! The season for disguises is fast approaching! Adults and kids alike are welcome to construct a getup - you can even wear what you make to our Market at the Scare event on the 25th! The event is free and open to all - more info in a future post, but you can call Anna Hochhalter, Urbana's Public Arts Coordinator, at 384-2311 for more information. Sprouts at the Market is back for a fall installment - this time, participating kids will learn about seasonal fall produce and healthy eating throughout the fall and winter, and can trick-or-treat for produce from participating vendors at the Market. U of I Dietetics student/Sprouts co-coordinator Jen Hewitt will lead the discussion, which will geared toward 5-10 year-olds. The first 50 kids receive a free Market at the Square shopping bag! * More information soon, but if you have questions you can call Lisa at 384-2319. Market at the Scare! We encourage patrons young and old to come dressed in their spooky/scary/cute/crazy/uncannily accurate best. There'll be candy for the kids (yeah, right... the kids), carved pumpkin giveaways, picture-taking, and more! Stay tuned for more details. Time got away from me this week (work always seems to get in the way of, well, work)! Basically, the Market this week should be grand. I extracted a personal promise from WILL Chief Meteorologist Ed Kieser that the weather tomorrow is going to be splendid. All the vendors will be bringing, as always, their showoffy best stuff - produce, goat cheese, kabobs and other ready-to-eat eats, art, crafts, plants, flowers, etc. I'm sure scads of performers will come out. You should, too - after tomorrow there're only 6 Markets left! The number of farmers markets in the United States continues to grow, reports USDA's Agricultural Marketing Service (AMS), reaching a total of 4,685 in August 2008. This represents a 6.8 percent increase since mid-August 2006, when AMS reported 4,385 farmers markets nationwide. "More and more consumers are discovering the wide array of fresh, locally grown produce available at farmers markets," said AMS Administrator Lloyd Day. "Another reason for their popularity is food buyers like the opportunity to interact with their producers." day pointed out since 1994, when AMS began to track farmers markets, the number of farmers markets nationwide has grown by nearly 3,000. Throughout the month of September, IFBA will join Feeding America to mark the first-ever Hunger Action Month by hosting a series of events aimed at eradicating hunger in Illinois. Hunger Action Month is part of a nationwide effort to motivate local action to end hunger. Illinois has experienced an unprecedented rise in the number of working families who are turning to food banks and pantries to make ends meet. As more and more families struggle to pay for surging costs of energy and other essentials, money left over at the end of the week for food is scarce. Hunger Action Month will enable elected officials, community leaders and all other Illinois residents to join the fight against hunger by raising awareness of the food crisis locally and nationwide. Together, we can reverse the trend. As part of the month's activities, several Executive Directors and employees of member food banks (including the Executive Director of the Eastern Illinois Foodbank, Jim Hires) are trying to make it on $25 a week - the average weekly allotment of food stamps to a typical recipient. 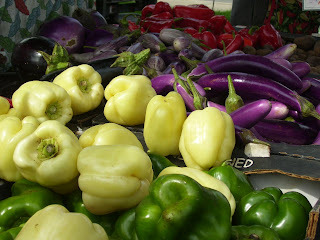 You can read about their attempts to eat well on $25 a week at the $25 Challenge Blog. This evening, the Eastern Illinois Foodbank will present a panel of speakers and advocates exploring the growing problem of hunger in our area and how it's affecting the thousands of families who aren't getting enough to eat. Running on Empty: Hunger's Impact on Our Community will begin at 7 PM at the Champaign Public Library. I'll be there - the Foodbank and the Market have enjoyed a good relationship over the years, with the Foodbank picking up excess produce after each Market throughout the summer. 3. We'll be showcasing at the Health and Wellness Showcase from 2-7 PM this Thursday! See their website for more info about other exhibitors and activities - it looks like there's a lot of fun stuff to do. Well, OK - the equinox is actually on Monday (at 10:44 AM, for those keeping track), but who needs astronomy to tell us we're sliding headfirst into fall? 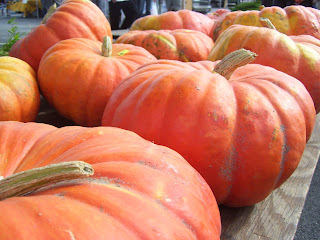 Sweater-weather mornings and the appearance of pumpkins, gourds, and all manner of fall vegetables at the Market tell us everything we need to know. If you're looking for something to do this weekend with free admission, free entertainment, great people-watching, tasty prepared food as well as food to fill your crisper/freezer/cupboards, look no further than this weekend's Market at the Square. Hoo boy. As of this writing, there are 71 fresh produce, prepared food, and art vendors scheduled to appear, and an unknown number of musicians and performers. Couple that with no U of I football this weekend plus beautiful, gorgeous weather? It's gonna be HUGE. The folks from Homestead Bakery will be back for another weekend (each one could be their last; it depends on how busy things get at the Pumpkin Patch!). Meister's Gluten-Free Mixtures will be back, so make sure you pick something excellent for the gluten-free person in your life (the number of people diagnosed with celiac disease is increasing). Local musician Angie Heaton will be out - not just playing her guitar, but also selling bracelets she makes from repurposed leather belts. Join us! We get started at 7 AM over in the Lincoln Square Village parking lot, and go until noon. 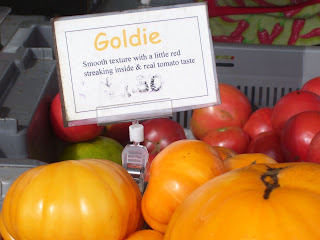 If you've never gone to the Market, now's the time to come out and see what the buzz is about. - folks from WILL AM/FM/TV will be there - maybe even a meteorologist, so you can take it up with them! You can find a full product list and scads of other information about this week's Market here (uploaded Fridays). 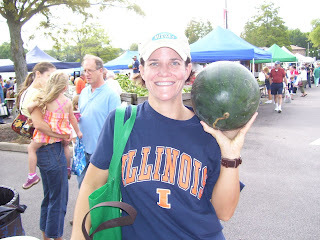 Also, you have to check out this blog by Michelle Ryan, a local radio personality who's trying her hand at the eating completely local thing - mostly from weekly trips to the Market - and is talking about it on the air as well as blogging about it. She's on WLRW/94.5 in the mornings. So far, she's REALLY making it work for her. If you're at the market and you see someone lugging around huge bags of produce hanging out with a person carrying a notebook and calculator? That's Michelle and her friend/accountant Bettina. Stop her and say hello - she LOVES talking about what she's doing! I'll post soon about the plethora of programming for kids we'll have in October - there'll be the 2nd Annual Bike Rodeo on October 4, another edition of Sprouts at the Market on October 18, and we just might be bringing back the Market's costume party this year on the 25th. Stay tuned! We've received several phone calls and emails regarding this program, which is an offshoot of WIC (Women, Infants & Children) and involves the distribution of coupons for redemption at farmers' markets for fresh produce. This list is likely incomplete; it'll be added to as necessary. For more information about the monthly farmers' markets being held onsite at CUPHD or further information about redeeming the WIC coupons, please contact Brandon Meline at (217) 531-4305. Tomorrow = Market #18 Already. Sheesh. One can still find peaches and nectarines at the Market. Corn, too. The MooMobile is officially gone until next year. Boo. Fryer Tuck's uses Stan the Meat Man's (aka Triple S) sausage in its sausage and egg sandwiches. A local radio personality is eating 100% locally, mostly from the Market, for three weeks*. The Urbana Free Library comes to the Market every first Saturday of the month during the season. Market site maps are available every week at the City of Urbana tent. Got batteries to recycle? We can take them at the City of Urbana tent. The Market LOVES social networking tools. Follow us on Twitter, Flickr, and Facebook - see links in the sidebar to the right. Various and assorted personalities from WILL radio and TV will be out at the Market starting 9/13. There is excellent free musical entertainment at the Market every weekend. There will be special stuff for kids at the Market in October - the Second Annual Bike Rodeo, another edition of Sprouts at the Market, and the return of Pumpkinfest! *As we shift gears into the fall season, I find myself wondering where the summer went, just like everyone else, but...it's been cool to mark time by produce seasonality. I've always been into the idea, but running the Market (or, uh, having the Market run YOU) almost requires following a different kind of calendar - the kind that's governed by what people are getting off their trees and plants or out of the ground. That's why I think it's awesome that Michelle Ryan, the 9 AM - 2 PM DJ on Mix 94.5/WLRW, is trying her hand at being a locavore for a few weeks. Lend her your support... and recipes! @lisa, re: the baskets - good call. I'll put the word out and see if I can entice someone here for next season. Re: port-a-pots - doubtful we'll get those, due to huge expense for delivery and lack of storage (the lot is used as a regular parking lot M-F, so I'd have to get them in/out every week for 28 weeks), but here's a tip: City Hall, right across Vine Street, is open on Saturdays and the bathrooms are way better than serviceable. No need to head over to the gas station! @amelia, re: cilantro - I love fresh cilantro, so feel your pain. Cilantro bolts easily in warm weather, though, so it's not really available locally during the height of summer. Look for it to start reappearing as our days get shorter and cooler. I'll call some growers this week and see if it's going to be back on the availability list anytime soon. @rumblebrumble, re: battery recycling tubs - done! Bring your batteries to the City tent (the orange one at the Market's northwest entrance) and we'll take things from there. @anna maria, re: rapini, cilantro, parsnips, loose cabbage, etc: all that stuff is coming back into season, so hunt around the Market in the coming weeks. I'll check and see if anyone is growing the kinds of cabbage you desire (I know Tomahnous Farm might have had some earlier this season) - check back! Re: the flower guy - I know who you're talking about, and I've already been working on him. I don't have a firm commitment, but last time we spoke he mused about coming this fall. I'll keep you posted. I'm loving the feedback... more, please.